There’s a stretch of the San Antonio River Walk where creativity flourishes and design inspires. An aesthetically sensual quarter where the visual components of color, form, line, shape, space and texture engage the senses, inspire pleasure and nurture the freedom to dream. This is San Antonio’s cultural arts district, and it is about to become the most coveted residential address in the downtown center. An architectural masterwork is soon to rise from the space at 123 Lexington Avenue—an artistic rendering of glass and stone that will reflect the unbridled creativity of its surroundings and add an über-luxurious niche to the residential offerings in the River City’s downtown district. The Arts Residences at the Thompson San Antonio Hotel invites you to expect the unexpected. Redefine yourself and your lifestyle. Transform, relax and indulge. 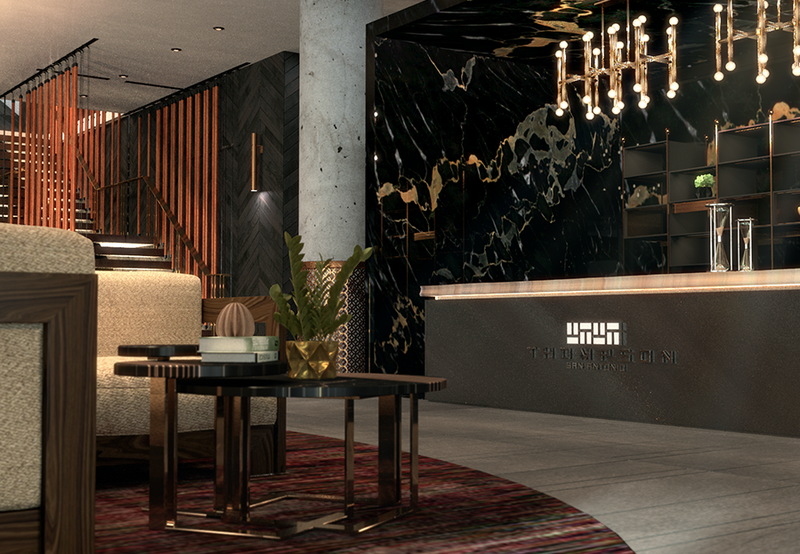 Perched atop San Antonio’s first Thompson Hotel—symbolic worldwide of ultimate panache—The Arts Residences’ 66 exquisitely designed condominium homes will be the first luxe-living accommodations available in San Antonio’s city center. With 21 open floorplans ranging from 735 to 7,324 square feet, plus five stately penthouses, each Arts Residences condominium home will be marked by organic sensibility and contemporary elegance, with soaring floor-to-ceiling windows; European appliances; Italian kitchen and bath cabinetry; natural stone and porcelain surfaces; and hardwood floors. Homeowners at The Arts Residences will lead a lifestyle as sophisticated as their homes, with full access to a vast array of amenities, including a resort-style pool and 5,000 square-foot pool deck with cabanas and bar, world-class restaurant, state-of-the-art fitness center, opulent spa, the Thompson Hotel’s impeccable room service, valet parking, 24-hour security and private entrances. Just to mention a few. Perhaps the ultimate expression of luxe living will be embodied by The Arts Residences’ ultra-attentive, round-the-clock private concierge service, which will cater to residents’ every whim, from hotel and travel arrangements, tickets to entertainment events, spa and golf appointments, birthday and holiday gift selections, party-planning assistance and pet services, and much, much more. Truly, San Antonio has seen nothing like this $116 million, 337,000-plus square-foot, 167-room luxury hotel-residential condominium tower. Developed by DC Partners, nationally known for its landmark developments, and San Antonio-based Universal Service Group, with architecture by Powers Brown, interior design by Amass & G. and a portion of funding by Houston EB5, The Arts Residences at the Thompson San Antonio will take urbane living to a new level in the city center, reshaping the character of the culturally rich downtown arts district.